TRUST Southern begins with 100% organic corn grown in Spallumcheen, British Columbia. It is triple-distilled in our hand-made CARL single copper pot still. For (3) years, it has rested in new American Oak barrels to gain character, complexity and colour. Once extracted from barrel, the corn based whiskey is then blended with Liberty’s rye for a final whiskey composition of 93% corn and 7% rye. TRUST Southern presents with a beautiful rich amber tone. 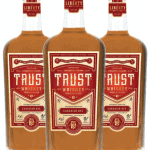 On the nose, TRUST Southern offers toasted orange notes. Mandarin orange peel, oak, and textbook ‘ripe’ peach character are underscored by a layer of warm caramel and vanilla. Rich and well balanced with spice, honey and subtle sweetness. Warm and soothing, with a long lasting finish that just lingers on and on. TRUST Southern is 100% Craft; a nod to our Southern neighbours who will recognize a true bourbon style. 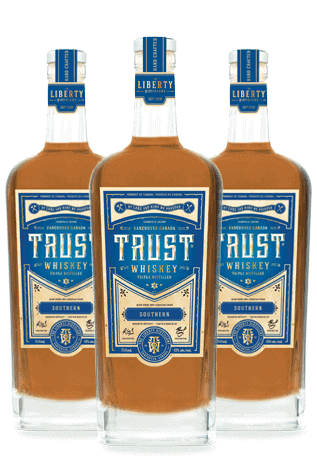 A versatile whiskey; TRUST Southern is perfect for sipping on the rocks, mixing into a traditional cocktail, or creating a twist on a classic. It is the perfect Whiskey to enjoy with friends, or on your own!